Eye on Water | Minnehaha Community Water, Corp.
Do you want to see your water usage data? Eye on Water is the solution for you! 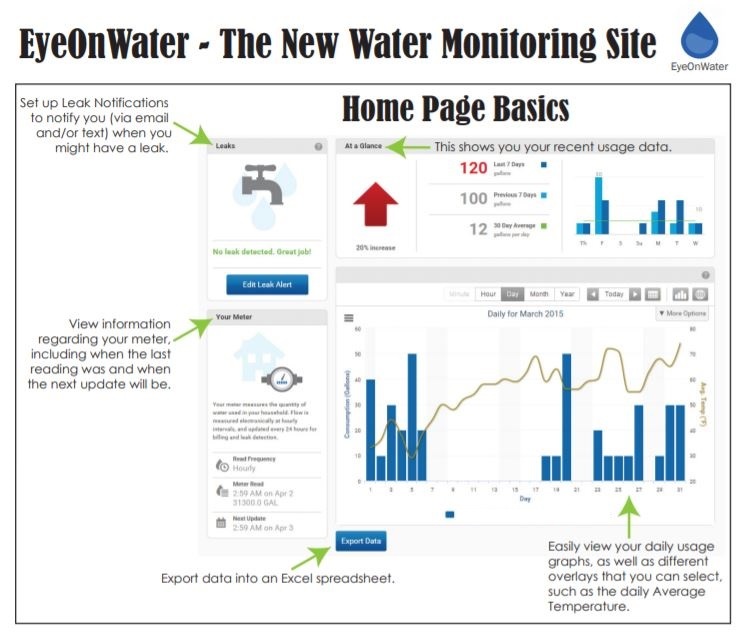 Eye on Water gives you direct access to your own water usage data and provides tools to help manage your water usage. After creating an account you can download an app through google play or the apple store. Visit EyeonWater on your computer using a supported web browser. You will need to enter your zip code and select Minnehaha Community Water Corp. Eye on Water will locate your account. If everything is correct click Next. If not please contact our office. Fill in your name and email address and create a password. Accept terms of agreement – click next. Check your email for confirmation and click on the link back to the “Eye on Water” website. If you did not receive an email double check to make sure it didn’t go into your Spam folder. After you have confirmed your account you will be able to use your user id (email address) & password to log in. If you have more than one account that you want to attach to the same email address you will need to call the office and we will add the other accounts to your EyeOnWater account.